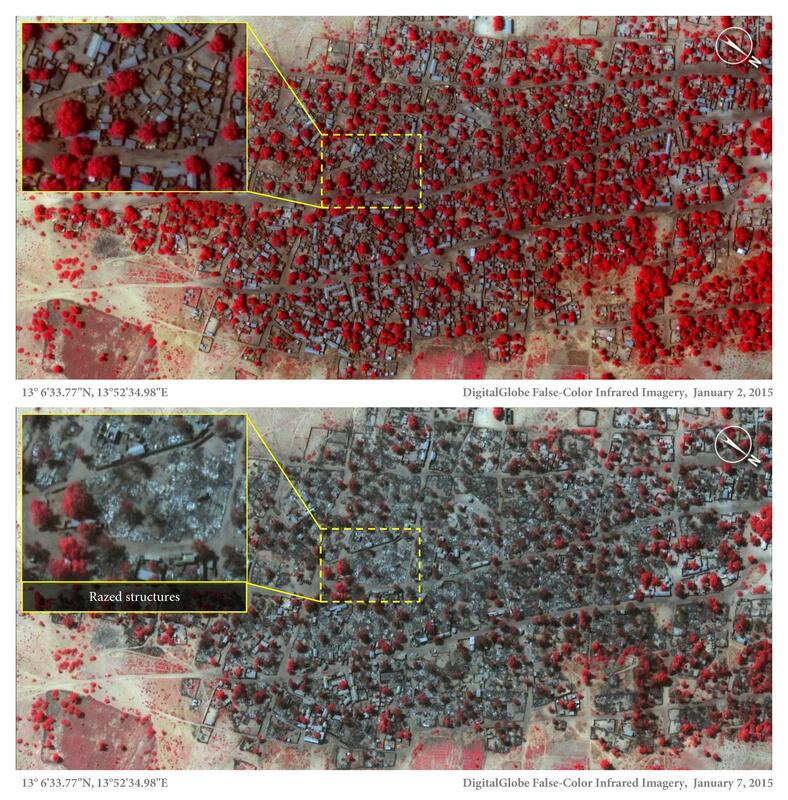 Boko Haram satellite images: Baga attack devastating. Before-and-after satellite images taken on Jan. 2 and 7. The before-and-after photographs of Doron Baga, which lies 1.5 miles from Baga, reveal the ferocity of the onslaught, with more than 3,100 structures damaged or destroyed by fire. Many of the wooden fishing boats that dotted the shoreline on 2 January are no longer visible five days later, when people had fled by boat in panic across Lake Chad. In Baga, a densely populated town less than 2 sq km in size, about 620 structures were either damaged or completely destroyed by fire. Amnesty has said that up to 2,000 people may have been killed in the attack, while the Nigerian army estimates the death toll at 150. Towns that formed state-sponsored militia groups known as the Civilian Joint Task Force (Civilian JTF) have suffered particularly brutal attacks. Civilian JTF groups were active in Baga and a senior military official confirmed to Amnesty International confidentially that at times the military took these members on operations to attack Boko Haram positions. A witness told Amnesty International that during the attack on Baga that he heard Boko Haram fighters saying they were searching for Civilian JTF members, as they went house to house shooting men of fighting age. Boko Haram continues to control the Baga area.